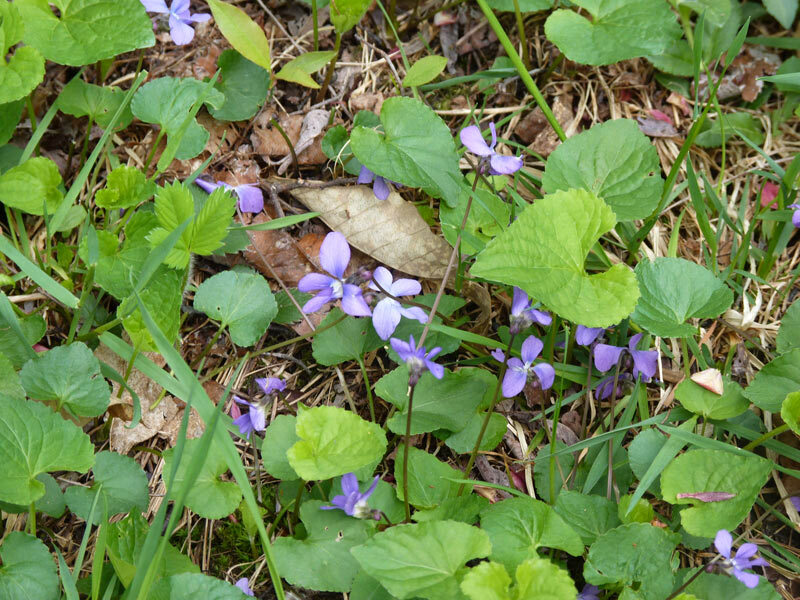 Early in the spring season (as in, right now), the small, wild purple violets begin popping up everywhere. Where I live, this is usually late April to Mid may. I actually found the first violets here in South East Michigan just last week, so its time to blog about violets! I am always delighted to see the violets, because they are sure sign that spring is here, the warmth has returned, and the landscape is painted in a variety of amazing colors once more. Springtime is the best time to harvest violets–you can harvest them typically for several weeks. I like to hit the same patch every 3 days, and each time harvest up to 30% of the violets there. If they are particularly abundant (as in the photo below) I might harvest some more. 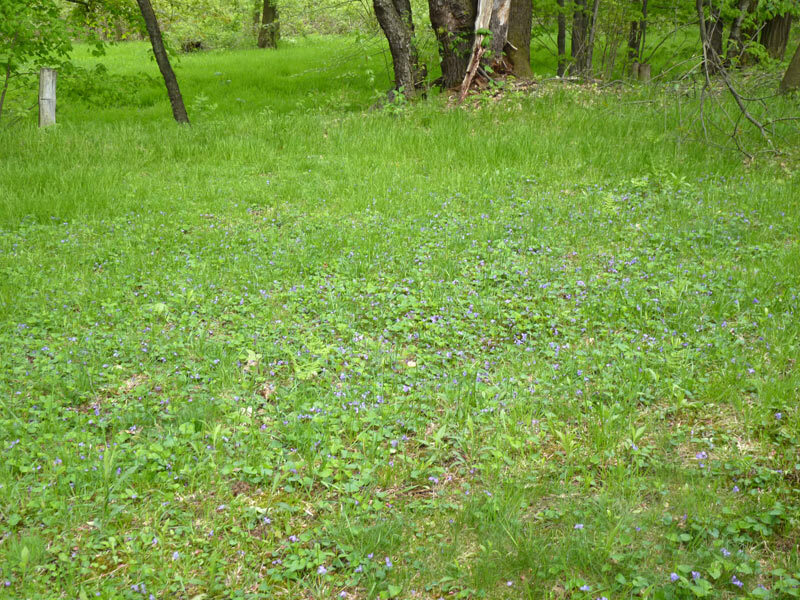 Yes, this whole area is full of violets! Violet flowers make really wonderful additions to a springtime salad–the freshly opened flowers can go right on top of your greens. They have a slightly sweet flavor. They are also a wonderful trailside nibble. I have also used them in fritters (similar to black locust flower fritters or zucchini flower fritters) and also in shortbread cookies. Fresh violets can also be candied (this is done by coating them with eggwhite and sugar). Dried violet flowers can be added to cakes, cookies, and teas. My favorite way to enjoy them is with a red rooibos tea–I add two teaspoons of red rooibos (or red rooibos with vanilla bean) and then 1 teaspoon of tea per cup. Its a delicious, refreshing beverage that can be enjoyed hot or cold. Violet Greens can be enjoyed fresh or cooked. I don’t find them to have much flavor, but if you are hungry and are in a pinch, they’ll work :). Take 1-2 cups of fresh violets (with stems still on) and wash them gently under cold water. Let them dry for a few hours on a towel. While they are drying, pull out an egg and let it sit out to room temperature. 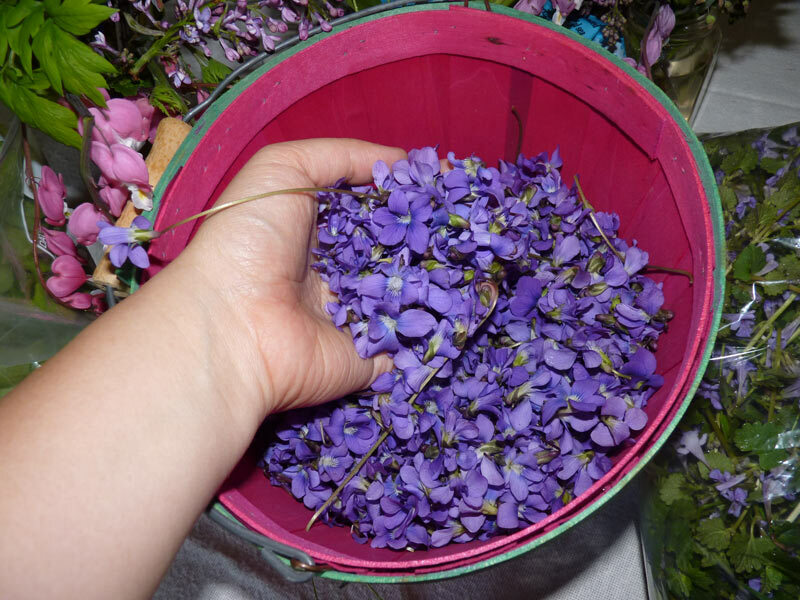 Once the violets are dry, separate your egg and mix up the egg white well. Dip each violet in the egg white (or paint it on with a brush) and set on waxed paper or parchment paper to dry. Sprinkle with sugar (powdered or regular, I prefer raw cane sugar). Make sure they get a good coating. Allow them to dry out completely (I’ve done air drying as well as dehydrator on the “herb” setting–I prefer the dehydrator), then seal them in a jar and enjoy! You should use them up within a few months. They are great for the top of cakes, floating in teas, etc. I’ve prepared two kinds of violet medicine so far. Last year, I made a violet tincture (but since its mucilaginous, I didn’t find this so great). I found that the Everclear I used was too overpowering, and I’m not sure what was extracted from the violets. I wouldn’t go this route. I also made the syrup recipe Matthew Wood suggests. This is a cold water infusion of flowers and leaves for 8 hours after which you can warm slowly and add sugar (or in my case, honey) to the mix. This is AWESOME. My molded after a few months (I don’t think I added enough honey) but it was great for coughs and sore throat. I haven’t tried making a hydrosol out of these yet, but its on my to-do list!